This entry was posted on May 27, 2012 at 12:59 pm	and is filed under Vintage Computing. You can follow any responses to this entry through the RSS 2.0 feed. You can leave a response, or trackback from your own site. I just went through this process with a circa 1994 Tandy Sensation! II. The drive still had the OEM software load and a ton of older DOS software. So whats the big deal if the drive is standard IDE? The twist was the drive was compressed with Stacker, so I went the INTERLNK route and did a direct zip archive from my Windows 98 machine. 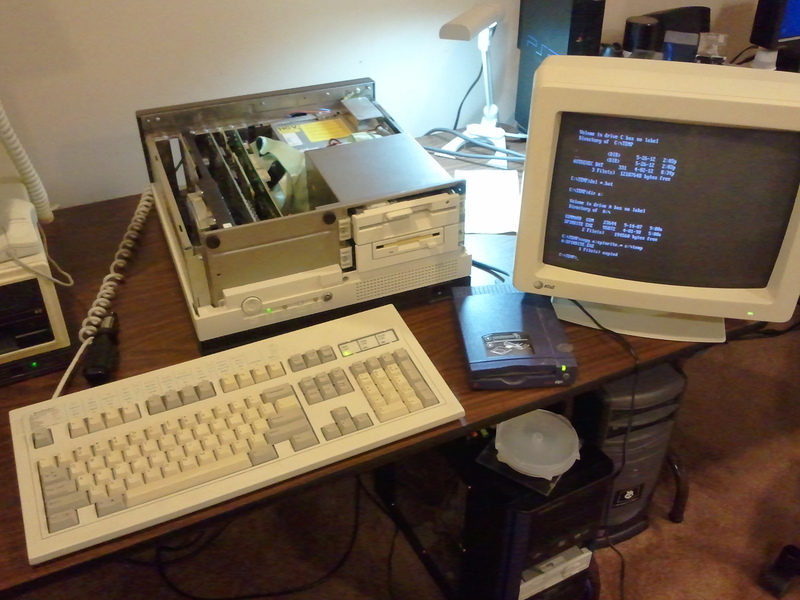 Despite the parallel port being “slow”, it was actually quicker for me to backup the drive, wipe it, and then plug the drive into a modern machine to rewrite the contents back to an uncompressed volume (the data didn’t take up more then the drive’s native capacity). I never really bothered with Zip drives, too many problems with the Click of Death, plus I already own the cables to do direct cable connection (which more then paid for themselves over the years of tech work!). INTERLNK/INTERSVR will also run without issue on a 8088 machine. The machine also had Laplink 3, which just about every XT-486 I’ve encountered seems to have on the HD for some reason. Never Laplink 2 or 4. I have an AT&T 6386 WGS that also works and would love to chat with you about it. I rescued it without the needed AT&T proprietary keyboard, but was able to find one from a great vintage computer parts place in NJ after an extensive web expedition. I haven’t done much with it for the last two years, but it’s a top quality piece of engineering made by Olivetti and I’ like to “set it up for appropriate use” and have some fun with it. Could it be a good gaming machine? It sure can be used for games, although it is a bit unwieldy (it’s a physically large machine IIRC). There’s nothing stopping you from slapping any ISA sound card in there and loading pretty much anything made between 1987 and 1992. For a list of games that should work fine on a 16MHz 386-class machine, check http://www.mobygames.com/browse/games/dos/tic,11/ti,65/ for some ideas. Please do share your “source” in NJ. Although I wouldn’t be surprised if I’ve been there before! The store I used to work at kept some vintage parts around, but not too much. The stock was mostly to support repairs for legacy hardware users since we were pretty much the only folks in the area that would touch any from older then a 486/Pentium at the time (ten years ago!). Trixter: Have you ever considered (or actually tried) using a SmartMedia NAND flash memory card in a 3.5-inch HD floppy/flexible disk drive? It is reportedly possible with an adapter such as  but I have never tried it because I have never had one of the required adapters. I have used SmartMedia cards, though; I think I still have a 128-MiB SmartMedia card in my Fuji FinePix 2600Zoom digital still camera from 2001 or 2002, which no longer powers on. says the adapter requires at least an 80486 CPU but I do not know how a device in a standard IBM PC(/AT)-compatible floppy disk drive can execute code on the CPU or otherwise do something which would require a minimum class of CPU? Maybe 80486 is only the lowest CPU class with which the adapter was tested or is officially supported. Anyway, SmartMedia cards are still available in storage capacities of up to at least 128 MiB, which is 28% more than a 100-MiB (or is it truly 100 MB?) Zip disk. A SmartMedia card also has the practical advantage of being usable as a High-speed USB Mass Storage device when installed in a USB (flash) memory card reader/writer. I know Zip drives are available with USB interfaces too but I do not know if USB Zip drives are USB Mass Storage devices: USB Zip drives may require a specific device driver? I have not used that adapter. It is useful for transferring data off of such a machine — you can copy to the “floppy disk” and then remove the SD card and read the contents on a modern machine. But it doesn’t exceed the capacity of a 1.44MB floppy, no matter the size of SD card you put into it. There are USB drivers for DOS, but there are no USB adapters for the class of machines I usually work with (ie. 386s and lower). I did not ask if you have used that specific model of adapter: I asked if you have ever used a SmartMedia card in a floppy disk drive, implying with any model of adapter. Why did you write “SD card” instead of “SM card”? I guess you meant to write SM. I was not suggesting using a USB device instead of a Zip drive connected via a parallel port: I was saying I know a SmartMedia card can be used as a USB Mass Storage class device by installing the SmartMedia card in a USB→SmartMedia card adapter but I do not know if USB Zip drives are USB Mass Storage class devices: if they are not, they probably require a device driver written specifically for a (USB) Zip drive. In this case, the USB Zip drive can only be used with a combination of OS and architecture for which a specific device driver is available instead of being usable with any OS with a generic USB Mass Storage device driver. I mentioned USB Zip drives because a relatively modern computer, especially a “laptop” computer, on which you want to access a Zip disk which was used in the parallel-port Zip drive may not have a parallel port. In this case, I think a USB Zip drive would be best because it can be used with desktop/tower computers, portable/all-in-one computers, and even embedded computers if they have USB Host capability. Even if you could add a USB host controller to an 80386 or lower class of computer, the USB software for MS-DOS may have been written or compiled for 80486 or a higher class of CPU. Are USB host controllers in IBM PC/AT-compatible computers even available for any bus other than PCI (Express), such as ISA or maybe MCA? I think all of the USB host controllers I have used in (80)x86 computers have used (conventional) PCI or PCI Express.